Settled on the banks of the Krishna river in the state of Andhra Pradesh, Vijayawada is one of the most visited cities in the state. Apart from being popular as the global city of future, it has gained popularity amongst tourists as a historic town with temples and ancient monuments. However, there are also several natural sites which allure thousands of visitors every year. As per local legends, the town is believed to be the site where Goddess Durga killed a demon and stayed for a while. It is also the place where Arjuna, the character from the epic Mahabharata, gained Pashupatastra, a destructive weapon, from Lord Shiva. Therefore, the city is of great historical, religious as well as cultural importance. Wouldn't you love to spend your weekend at such an amazing destination? If yes, then read on to know more about this beautiful city and its gorgeous tourist spots. The region in and around Vijayawada experiences a hot weather during the summer season, therefore, the best time to visit it is from October until the end of March. This is the period when the natural beauty of the city is at its peak and the weather is perfectly fine with optimum temperature conditions. By Air: Vijayawada is well connected to all other major cities in India by air. Therefore, you can take a direct flight from Hyderabad to Vijayawada. By Rail: Vijayawada has a railway station of its own. You can catch a direct train from Hyderabad to reach Vijayawada. The journey will take an approximate time of 6 h and 30 min. By Road: If you desire to travel by road, then you can either hire a cab or take a bus from Hyderabad to reach Vijayawada. It is easily accessible by road. Once you are on your way, you can take a break at Jaggayyapeta and savour its ancient sites which date back to the period before the Common Era. Jaggayyapeta is a small town in the Krishna district and is located at a distance of about 196 km from Hyderabad and 81 km from Vijayawada. The major attraction here that will certainly interest you is the Buddhist Stupa which dates back to thousands of years. This age-old stupa is said to have been established in 200 BCE. As per historical records, the town was once a home to numerous Buddhist monks. Today, you can only find the remains of this ancient stupa and several other structures. You can also visit the relaxing banks of the Paleru river which flows through the town. 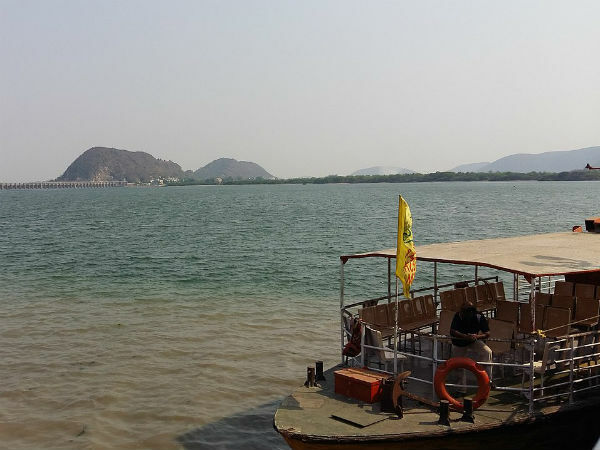 Vijayawada is located at a distance of about 272 km from Hyderabad and makes for an ideal getaway for people who are looking forward to spending a relaxing weekend with their family and friends. From visiting its age-old temples to savouring river islands and studying the beauty of caves to exploring its beautiful hills, there is a lot to do within its boundaries. Following is the list of the major places which every tourist and traveller must consider visiting while in and around Vijayawada. Located on the outskirts of Vijayawada, Undavalli Caves is a treat to every history lover. It is the place where you can spot thousands of years old structures and sculptures. These caves are said to have been built in the 7th century when they were used by the Buddhist monks as rest houses. They were carved out of a rocky hill, and hence they have been recorded as some of the most beautiful architectural masterpieces. The major attraction of the cave is the idol of Lord Vishnu in a reclining posture. Located atop Indrakeeladri Hill and dedicated to Goddess Durga, Kanaka Durga Temple is one of the most visited temples in the region. Hindu devotees from all over the state come here to pay their respects to the goddess, especially during the festive seasons of Navaratri and Theppotsavam. As per Hindu mythology, the temple is said to have been established thousands of years ago when Goddess Durga killed the demon Mahishasura and saved her followers from his atrocities. If you are looking forward to capture the natural beauty of Vijayawada on your camera, then you must visit the Prakasam Barrage. It is built across the Krishna river and is a perfect place to take a break from the hustle and bustle of the city and get lost in its cool and pleasant surroundings. How about relaxing and chilling in the midst of river as you gaze at the natural beauty of Vijayawada? If you would love to do so, then Bhavani Island amid the Krishna river is your destination here. It is one of the largest river islands in the country and makes for an ideal spot for picnickers and weekend travellers. It is a small hill surrounding the settlement of Vijayawada and houses one of the first Gandhi memorials in the country. From a library to a planetarium and stupas to stone inscriptions, there is a lot to explore at this wonderful place. If you think your journey to Vijayawada ends once you are done exploring the above-given destinations, then you are definitely wrong. There is a lot more which can be savoured within its boundaries. The list includes Victoria Jubilee Museum, Subramanya Swamy Temple, Rajiv Gandhi Park and Mogalarajapuram Caves.